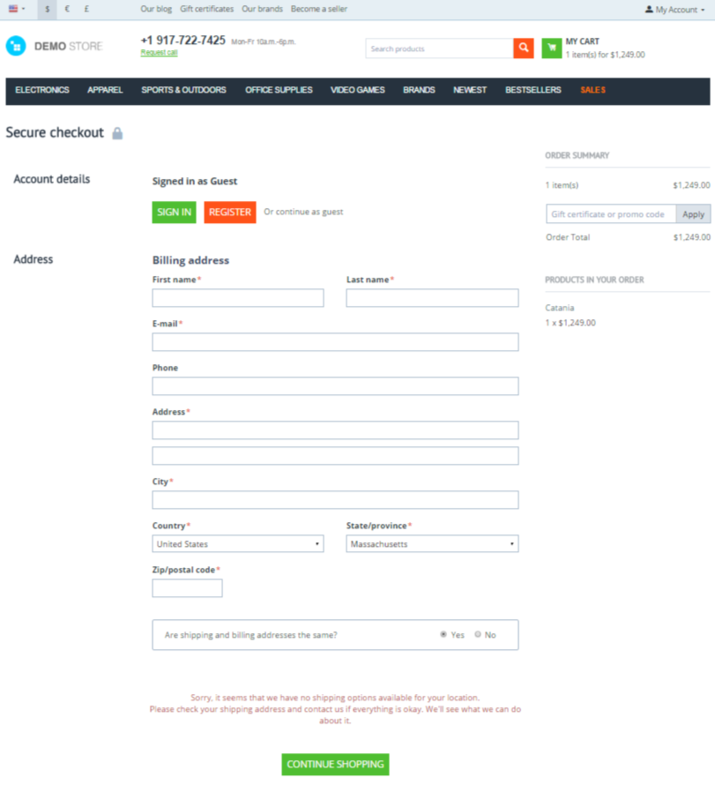 Make the checkout fast and easy for your customers with our One Page Checkout add-on. 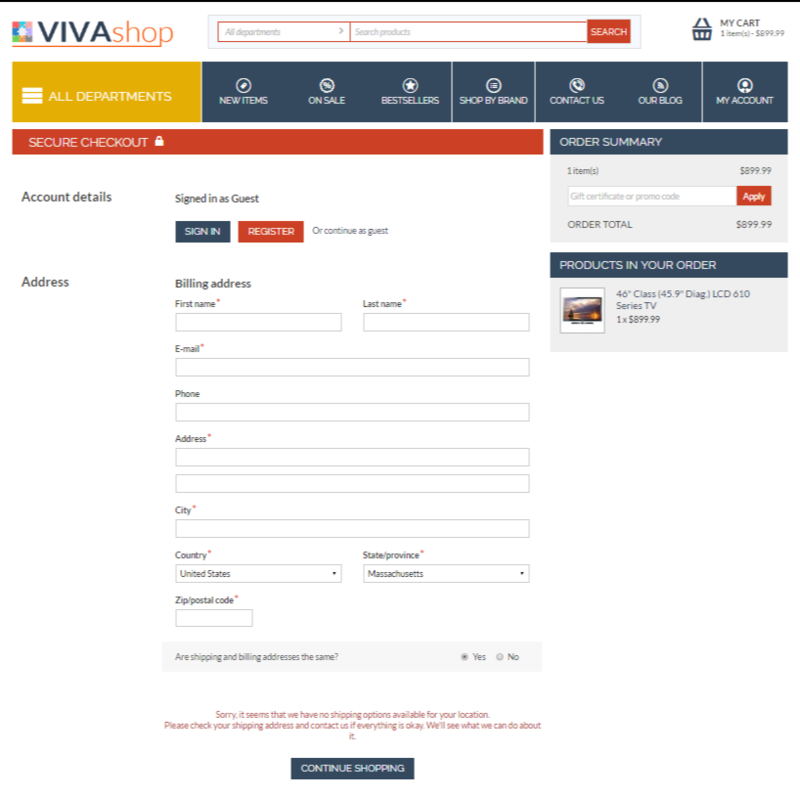 The necessary blocks will be uploaded automatically during the checkout. It is specially designed to keep the customers focused on completing the transaction. I kind of like your checkout, possible thinking of investing in to it in near future. However what I do not like most is red warning "sorry no shipping options in bottom of the page", all 2 3 4 are hidden and are revealed, message goes away as soon as you type absolutely anything, for example fist letter of name. Its really strange of such realisation, why the heck system waits for name, it is not enough data to process anything, default location US is pre defined.. I suppose this red warning would put of any customer to buy anything in your shop, one page checkout is to reveal all steps without making any extra steps.. Yes, you are right. We will fix the issue. I Like, but it confuses me a little, the sign in or guest option at the top feels like it should be at the bottom, then when I filled in "register" nothing appeared for a few seconds to tell me it was chewing over the information, then I was unsure about filling in the info in the other fields. Maybe a message "popup" after selecting register to say, thanks, now fill in the billing address etc. There is rather big choice of one page checkout addons. All are pretty much same. I think most important step is first one login, register, guest.. too many options. I wonder how Fast authorization works from cart power. It gives just one email field to check if such exist in db if so it asks to login if not simply continue. Yes, I agree with you. We will fix the issue. The idea is good, we will think about it. Thank you. I find it disconcerting that Simtech, being the architects of CS-Cart, are selling Addons in completion with other third-party addon providers. On the flip-side, if the addons are lifetime upgrades, being fully compatible with all future CSC updates then its not such a bad thing. Our One-Page Checkout addon from cscartrocks stopped working as a result of one of the updates. IMO something as fundamental as a single-page checkout, with intelligent, customer friendly work flow is so important that it should be built into the standard cart. Store owners want to sell online, not spend days stuffing about installing and updating addons. Please dont go down the Prestashop path where every additional function requires an addon! What is the lifetime of this, and other SimTech addon(s)? Will I need to pay to update the addon as it becomes incompatible with future CSC updates? Or does SimTech guarantee future compatibility.? We are not architects of CS-Cart. Simtech Development, Ltd. and CS-Cart (Simbirsk Technologies, Ltd.) - two independent companies. We are engaged in custom development which includes a full range of services from the design to the server management. You pay for the add-on only once, then you will just download the updates. If you have to purchase stuff from Simtechdev to get new features why do I have to pay for cs-cart prolonged updates if all they give bugfixes and more new bugs ? I had my updates always active but not for last 3 months, simply do not see anything that interests me in those 44x or 4xx updates..
Its just cycle of life. Prior to cs-cart I had shopping cart called shop-script. They had quite decent community and then started expanding product range killing / not putting enough attention to main product (whas cs-cart do for past 2 years). Luckily I have abandoned it right on time.. Please dont go down the Prestashop path where every additional function requires an addon! Please excuse my misunderstanding , as the cscart About Us page states "We are the Simtech conglomerate". Its a little unclear I took this to mean that cscart is one of Simtech's products. Some other 3rd party addons require the purchase of "subscribe for updates" which lasts only 6 months. Not something we would be interested in doing, so that waas a waste of money! All installed Simtech addons are updated at the same time that the cart updates are installed, is that correct? So do you decide not to upgrade your store at all? Not at all, but upgrade only when I get actual upgrade - improvement. Since 441 there are enhancements related only to multi vendor and ultimate version, ok also recaptcha witch I already purchased from you..
No, our add-ons are not updated automatically. Nearly once a month there is an update. Your checkout should look like your amazon payments..
Is that Amazon Pay or Amazon Checkout (I know it says pay in the headers, but AZ is taking the checkout API obosolete and only supporting the Pay API). It's the Amazon Pay. You can find more in the user guide. Also here we can discuss the Pay with Amazon add-on. Now the One-Page Checkout add-on works properly with the default Payment dependencies add-on. 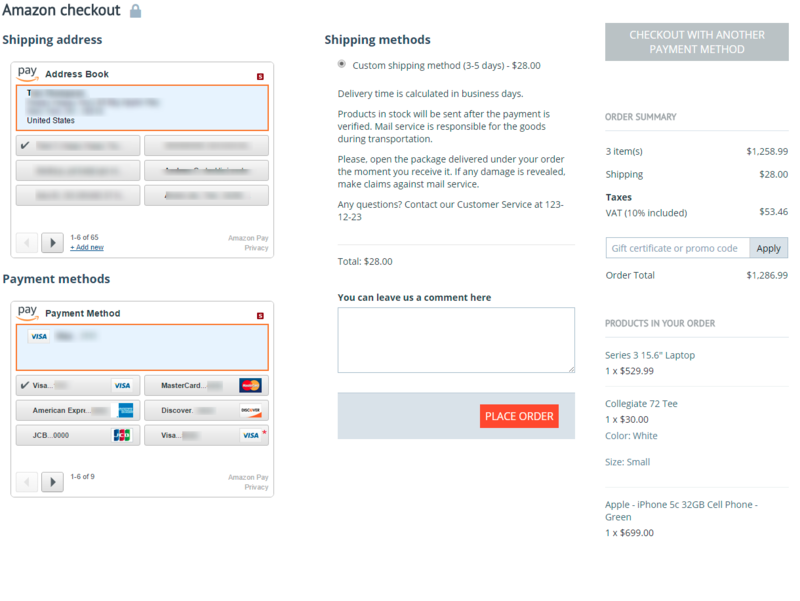 I would like to inform you that the ability to show all sections of the checkout upon page load has been added. Please have a look at the One-Page Checkout add-on.